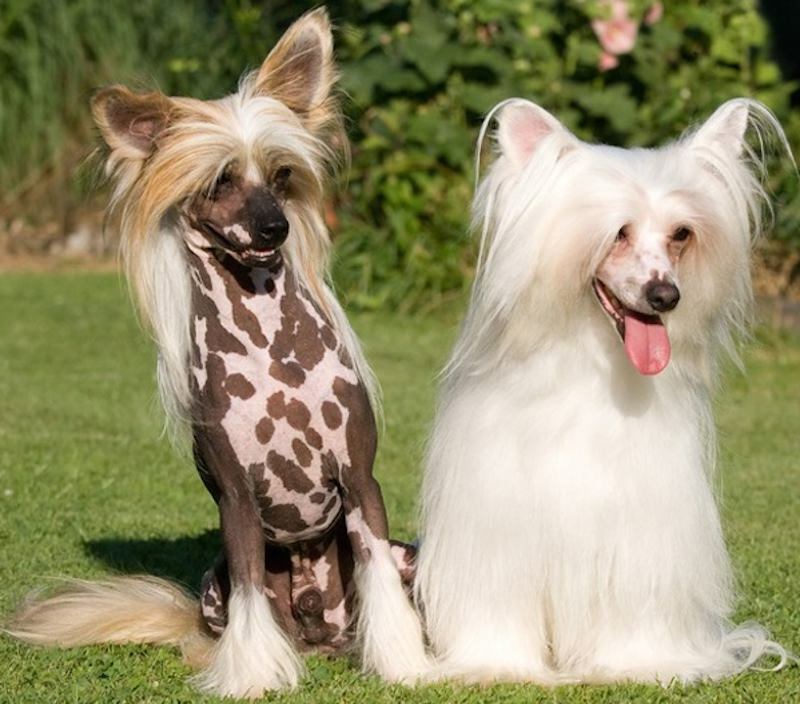 Chinese Crested Dog is believed to have evolved from African hairless dogs that were acquired by the Chinese and reduced in size. At one time it was known as the Chinese Ship Dog since Chinese sailors often took the breed along on voyages to hunt down shipboard vermin. Pups were often traded with merchants in port cities and even today the breed can be found in ancient port cities around the world. 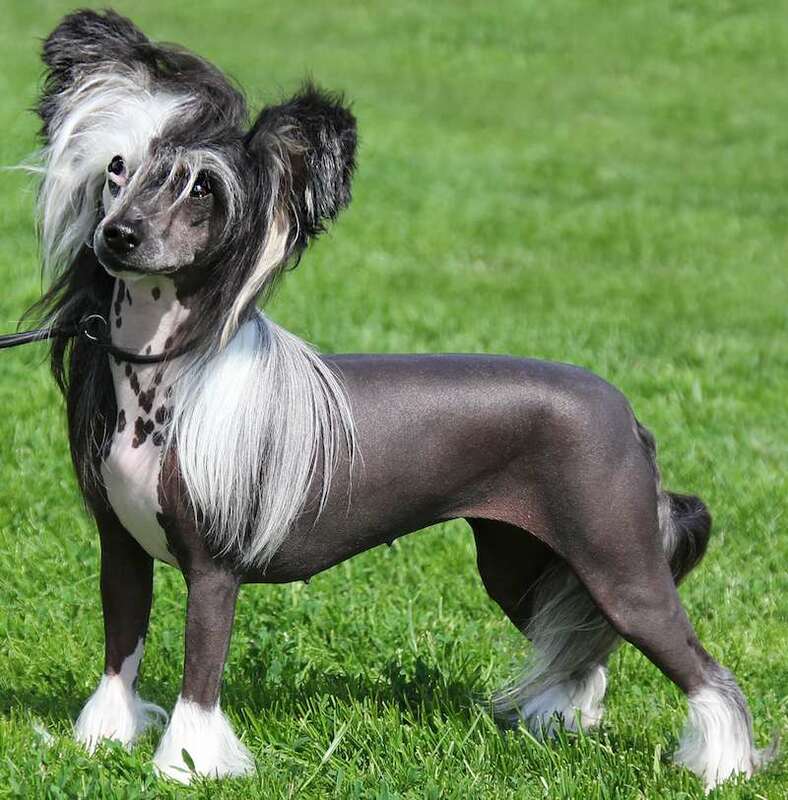 Spanish explorers found the Chinese Crested Dogs in Mexico and parts of Central South America as early as the 1500s. 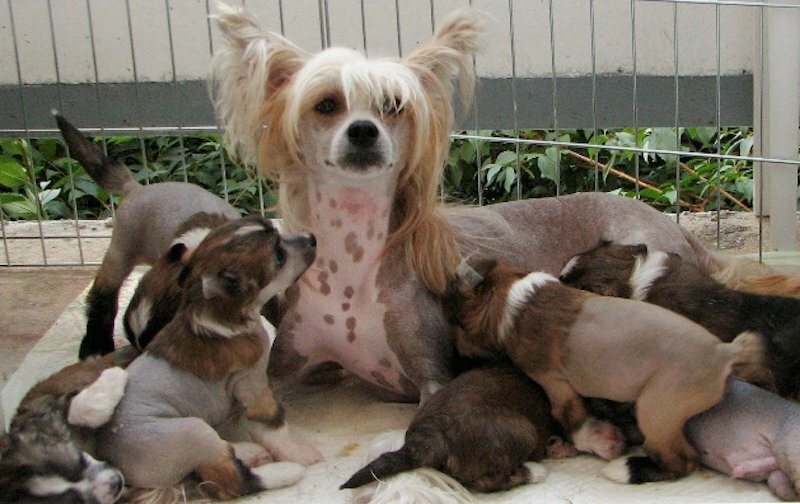 The breed was also found in Africa and Asia in the 1700s and 1800s. They first appeared in European paintings and prints in the mid-19th century. 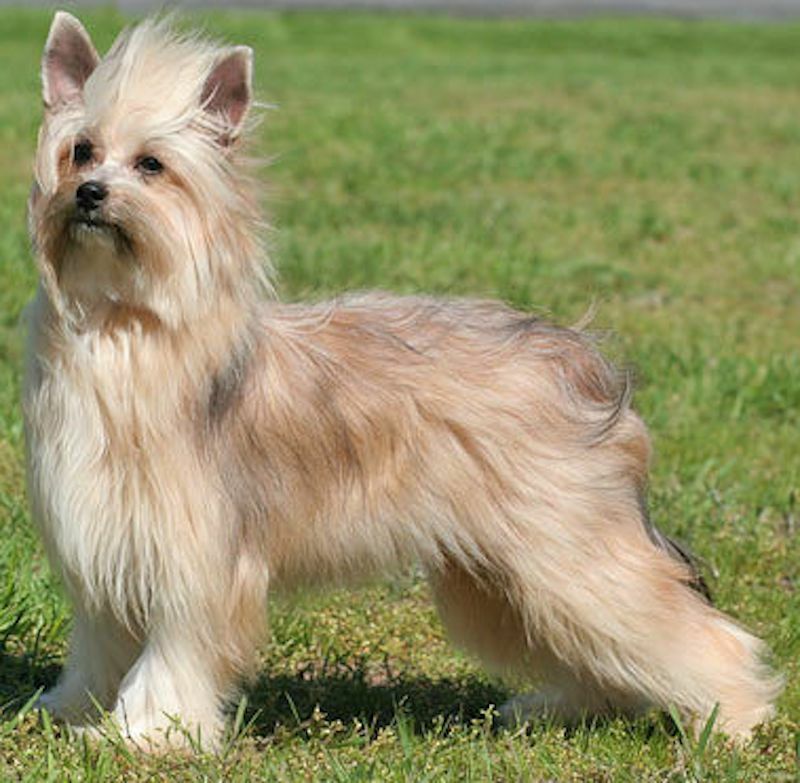 They first appeared at dog shows on this continent in the late 1800s. 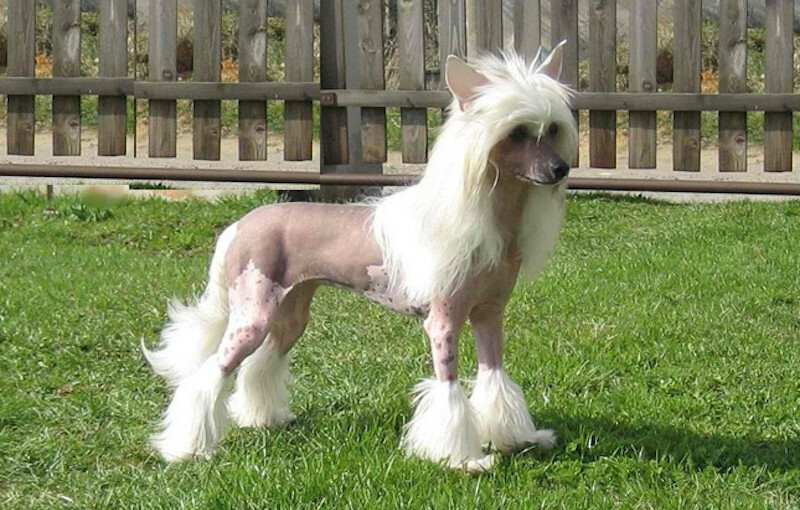 General Appearance: A small, active and graceful dog; medium to fine boned, smooth hairless body, with hair on feet, head and tail only or covered with a soft veil of hair. 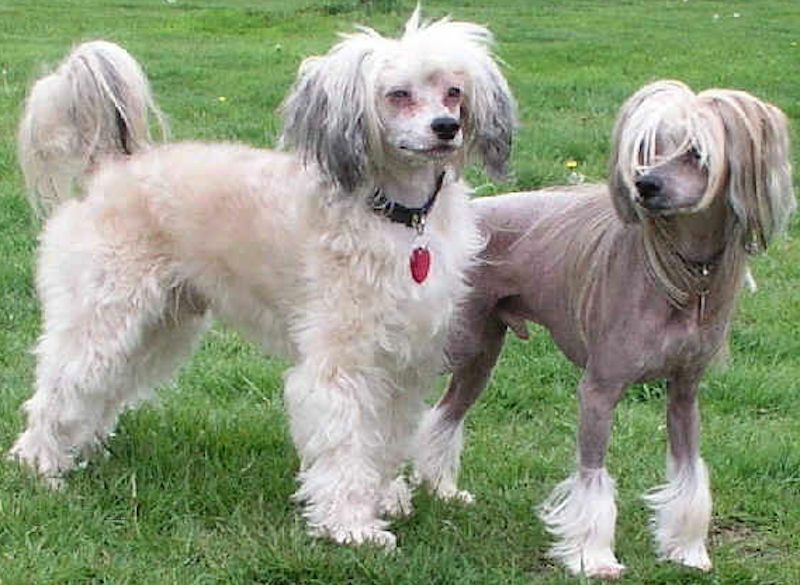 Chinese Crested Dog Temperament: Happy, never vicious. Head: Slightly rounded and elongated skull. Cheeks cleanly chiselled, lean and flat, tapering into muzzle. Stop slightly pronounced but not extreme. Head smooth, without excess wrinkles. Distance from base of skull to stop equal to distance from stop to tip of nose. Muzzle tapering slightly but never pointed, lean without flews. Nose a prominent feature, narrow in keeping with muzzle. Any colour nose acceptable. Head presenting graceful appearance, with alert expression. Lips tight and thin; ideally, crest beginning at stop tapering off down neck. Crest itself may flow to any length, a long and flowing crest preferred, but sparse acceptable. Eyes: So dark as to appear black. Little or no white showing. Medium size. Set wide apart. Ears: Set low; highest point of base of ear level with outside corner of eye. Large and erect, with or without fringe, except in Powder Puffs where drop ears are permissible. Mouth: In both varieties: lips are tight with a regular scissor bite, i.e. the upper teeth closely overlapping to the lower teeth and set square to the jaws is preferred, a level bit is acceptable. An undershot bite is considered a fault. In the hairless variety irregular shaped canines, or missing canines, incisors, premolars or molars is to be expected and not to be penalized. In the Powderpuff variety, lack of full dentition is considered a fault. Body: Medium to long. Supple. Chest rather broad and deep, not barrel ribbed. Breast bone not prominent. Brisket extending to elbows; moderate tuckup. Hindquarter: Rump well-rounded and muscular, loins taut, stifles firm and long, sweeping smoothly into the well let-down hock. Angulation of the rear limb must be such as to produce a level back. Hind-legs set wide apart. Tail: Set high, carried up or out when in motion. Long and tapering, fairly straight, not curled or twisted to either side, falling naturally when at rest. Plume long and flowing, confined to lower thirds of tail. Sparse plume acceptable. Gait: Long, flowing and elegant with good reach and plenty of drive. Coat: No large patches of hair anywhere on body. Skin fine grained. Smooth warm to the touch. In Powder Puffs coat consists of an undercoat with soft veil of long hair, well coated feature.